The White House and the Department of Health and Human Services (HHS) solicited millions in donations from private health care companies for a nonprofit organization to promote Obamacare, according to the Government Accountability Office (GAO). The GAO released a report on Monday following a request from Republican senators to investigate HHS’s coordination with Enroll America, a "nonprofit, nonpartisan" organization founded by former White House staffers. The report noted that former HHS Secretary Kathleen Sebelius contacted the CEOs of five organizations last year to "solicit support" for Enroll America, which it would use to promote Obamacare. Additionally, the report links the White House to Sebelius’ outside fundraising for the first time. A White House official contacted the Robert Wood Johnson Foundation (RWJF) asking for a "significant" financial contribution for Obamacare’s private national outreach effort. 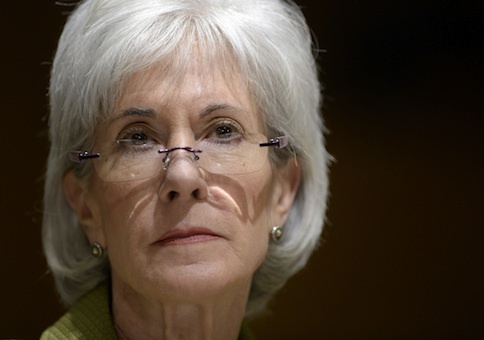 The White House had said they did not sign off on calls made by Sebelius. According to the report, Deputy Assistant to the President for Health Policy Jeanne Lambrew contacted the group in 2012, telling a RWJF staff member that Enroll America would need roughly $30 million for Obamacare outreach. "RWJF told us that the official also indicated a hope that RWJF would provide a significant financial contribution to support such efforts, but did not make a specific funding request on behalf of Enroll America or any other outside entity," the GAO said. "While White House officials agreed that the deputy assistant to the president for health policy did not make a specific funding request on behalf of Enroll America or any other outside entity, they stated that this official did not offer RWJF a specific estimate of the level of financial support needed for national outreach efforts," the GAO added. Sebelius called the CEO of RWJF In January 2013 to encourage the company to "continue providing financial support to Enroll America." The company donated $13 million after the call. "The RWJF representative told us that the foundation made two grants to Enroll America in 2013 that were dated after the call with the Secretary: a $3 million grant in April 2013 for operational support and a $10 million challenge grant in May 2013 through which RWJF agreed to match donations that other sources made to Enroll America through September 1, 2013," the GAO said. "The RWJF representative told us that the decisions to make these two grants were not made in response to the secretary’s call." RWFJ said the $10 million grant would help the organization build partnerships and hire staff. Enroll America went on to create ads featuring a rapping pug to try to convince Americans to sign up. Sebelius also called the CEO of H&R Block, asking the company to donate to Enroll America after a "general discussion of the potential effect of PPACA on H&R Block’s business." The CEO said during the call that the company was considering making a contribution to Enroll America, though Sebelius asked for more. "HHS officials told us that the secretary validated the work of Enroll America and suggested an amount higher than what H&R Block had said it was considering," the GAO said. H&R Block did not make a contribution. The former Secretary also called Kaiser, Ascension Health, and Johnson & Johnson for "technical support," but not for financial contributions, though Ascension Health officials said their company pledged $1 million to Enroll America "subsequent to the secretary’s call." The GAO noted that references to Enroll America were featured in Sebelius’ "standard talking points," and the agency "worked extensively" with the group on promotion of the healthcare law outside of the government’s own marketing efforts. Overall, the administration spent $674 million on Obamacare promotion. Republicans have questioned the legality of HHS soliciting funding from private organizations since last May, when Sebelius’ fundraising push was first reported. Sen. Lamar Alexander (R., Tenn.) said her actions could be illegal under the Anti-Deficiency Act, which prohibits government employees from making or authorizing funding that has not been approved by Congress. This was not the first time Sebelius was accused of violating federal law during her helm as Secretary. In 2012, the Office of Special Counsel (OSC) ruled that Sebelius violated the Hatch Act when she endorsed a Democratic candidate for governor while speaking in her official capacity as HHS secretary. This entry was posted in Issues and tagged HHS, Kathleen Sebelius, Obamacare. Bookmark the permalink.